When Google launched its social network, Google+, it hoped that it would prove a popular competitor to the likes of established names such as Facebook and Twitter. Unfortunately for Google, though, things didn't quite work out like that. While Google's search engine and Gmail continue to be hugely useful, comparatively few people use Google+. Which can be particularly irritating if, as someone who uses Gmail, you are annoyed by the Google+ links, buttons etc that have started to clutter your account in the past year or 2. 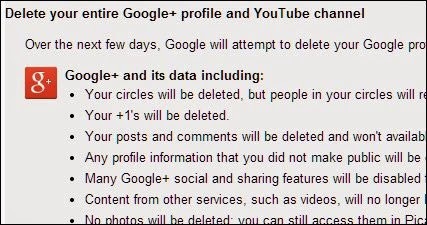 If you want to remove Google+ from your Gmail account, this is actually relatively straightforward. Once you're signed into Gmail, just go to http://plus.google.com/downgrade and you'll be given the option to remove what's known as your Google Profile. Before you press the button to confirm, it's worth reading the page of information that appears. If you're a heavy user of Youtube, for example, it will affect the availability of your videos and channels, so check out the details of how to prevent this. As for your Gmail account, though, this will remain intact. Only your Google Profile, which is basically the information that you share with others via your Google account, will be deleted. You'll end up with a Gmail screen that looks like it always used to, with no Google+ clutter. Make sure you only ever delete your Google Profile, rather than your Google Account. If you do the latter, all of your access to Google services, including Gmail, will be permanently lost.